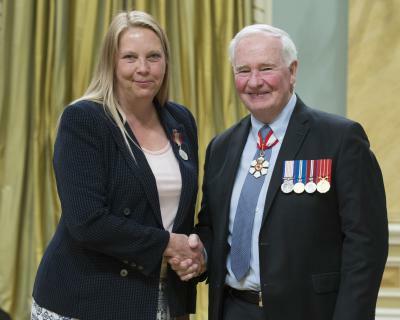 On April 27, 2017, Pugwash District High School teacher, Teresa Kewachuk, joined 45 other recipients from across Canada in Ottawa to receive the Sovereign’s Medal for Volunteers. His Excellency the Right Honourable David Johnston, Governor General of Canada, presented the medals during a ceremony at Rideau Hall. The Medal for Volunteers recognizes the exceptional volunteer achievements of Canadians from across the country in a wide range of fields. As an official Canadian honour, it also pays tribute to the dedication and exemplary commitment of volunteers. Teresa’s citation from the ceremony reads as follows: Teresa Kewachuk is the volunteer on-site manager at the Thinkers Lodge National Historic site, the birthplace of the international Pugwash Movement that strives for nuclear disarmament. In the summer, she supervises university and high school interns, gives tours and oversees events; during part of the school year, she and the community volunteers welcome the general public. The photo of Teresa with His Excellency the Right Honourable David Johnston, Governor General of Canada, is courtesy of MCpl Vincent Carbonneau, Rideau Hall, © OSGG, 2017.